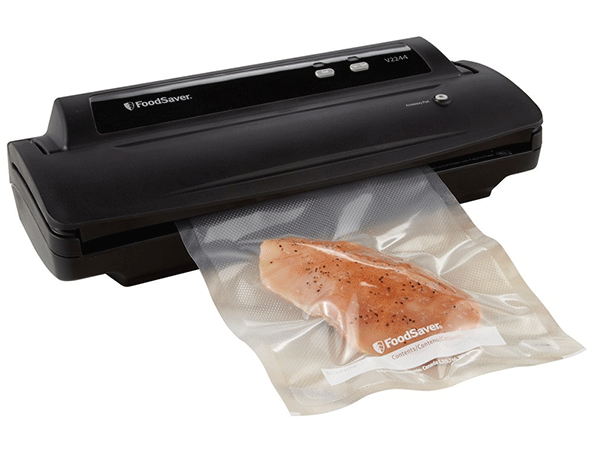 A vacuum food sealer allows you to preserve food, and many of the best models are easy to use. 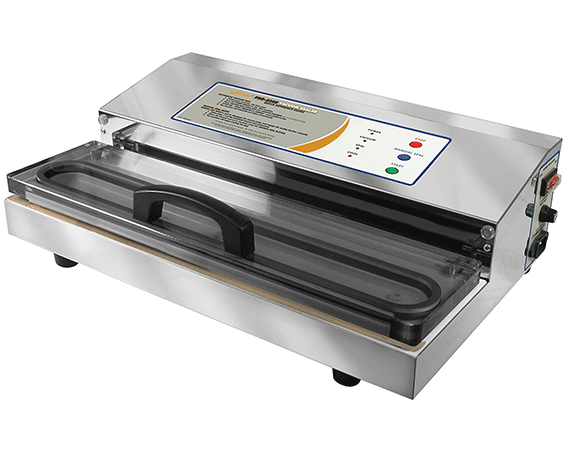 With a food sealer, you can seal large amounts of food, and the vacuum seal prevents the food from going bad. After your food has been sealed, you can tuck it into the freezer. Food sealers are very good at preserving food because they remove oxygen from the container, which prevents bacteria growth. When liquids, meats and vegetables are exposed to oxygen, bacteria causes these food items to spoil. If you’re looking for the best vacuum food sealers, there are different types of products to consider. For example, many consumers prefer a countertop model because it’s compact and easy to use. With a countertop model, you can easily seal liquids and solid food. Some other products run on batteries and feature a handheld design. 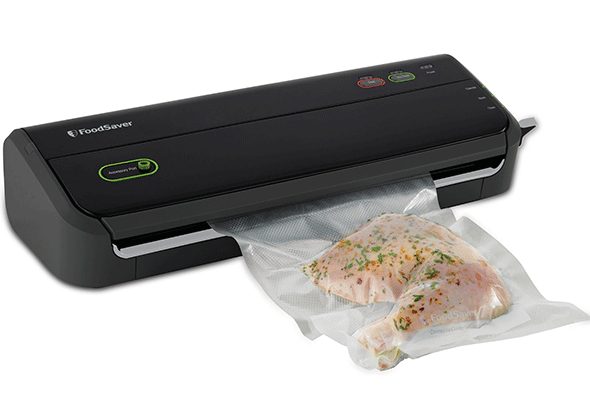 A chamber vacuum sealer removes most of the air from the chamber, and it’s popular for professional use. An external sealer only removes air from a bag, and it’s ideal for home use. 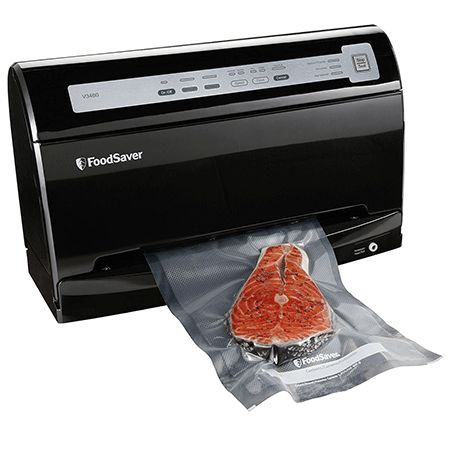 The FoodSaver FM2100-000 features newer technology, and it significantly minimizes the amount of bag material needed to preserve food. When compared with many alternative products, it uses about 40 percent less material. To provide maximum control, this product comes with food settings for dry and moist food. It also features a roll cutter and storage. 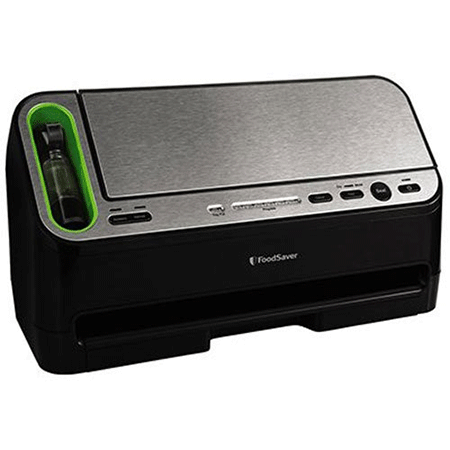 The FoodSaver FM2100-000 has a vertical design, and it’s great for countertop use. This product comes with five bags, and the accessory hose makes it easy to seal your favorite types of food. The Ivation vacuum sealer is an important appliance for every cook, and by removing the air from a food storage bag, it can dramatically improve the lifespan of your food. Since it removes the oxygen from the bag, it prevents contamination from insects, mildew, mold and microbes. When compared to conventional storage methods, this product can make most foods last up to five times longer. It’s even useful for protecting food from freezer burn. 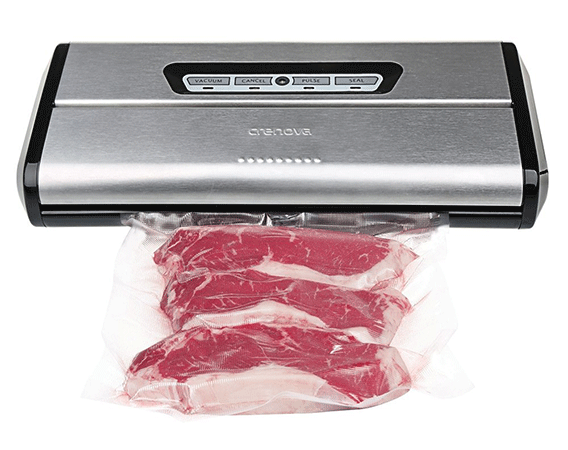 The Ivation vacuum sealer comes with 10 bags, and it features a built-in port for additional accessories. With a compact, lightweight design, it’s easy to move around and can be kept on a countertop. The FoodSaver V3460 is an automatic sealing system, which is great for consumers who’d like to avoid manual labor. This product takes the hard work out of sealing and preserving food, and it features a compact, vertical design. The FoodSaver V3460 is completely automatic, and it comes with two different vacuum speeds. For an optimal seal, it offers different settings for moist and dry food. This product comes with a convenient bag cutter and roll holder, but it’s designed to work best with FoodSaver bags. The Weston Pro-2300 seals food rapidly, and it features a transparent lid. For delicate, moist foods, it has a manual mode, and with powerful suction technology, it can make most types of food last five times longer. This product uses 935 watts of power, and it features a stainless-steel design. It’s one of the best countertop vacuum sealers available, and since it comes with an automatic mode, it can seal food with the press of a single button. Here we have an appliance that is designed for food sealing, and for easier sealing of zipper bags, canisters and containers, it comes with a handheld sealer. This appliance automatically detects the bag, and to seal your favorite foods, it only requires two simple steps. The handheld sealer eliminates the need for most extra attachments. For the best results, this product is designed to work with FoodSaver rolls and bags. 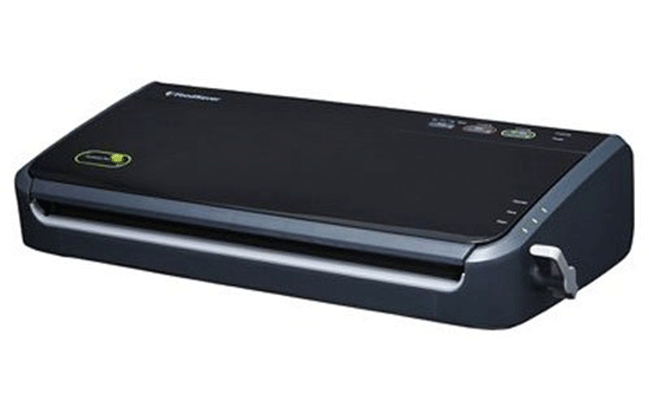 The FoodSaver FM2000-FFP is a top vacuum sealer, and it’s designed to use minimal bag material. This product features a removable drip tray, and if you love to save your food, it can save you a lot of time. This product works best with FoodSaver bags, and it uses about 40 percent less bag material than many alternative vacuum sealers. Since the drip tray is removable, you can avoid messy food waste. When used frequently, this product can save you thousands of dollars per year on food. 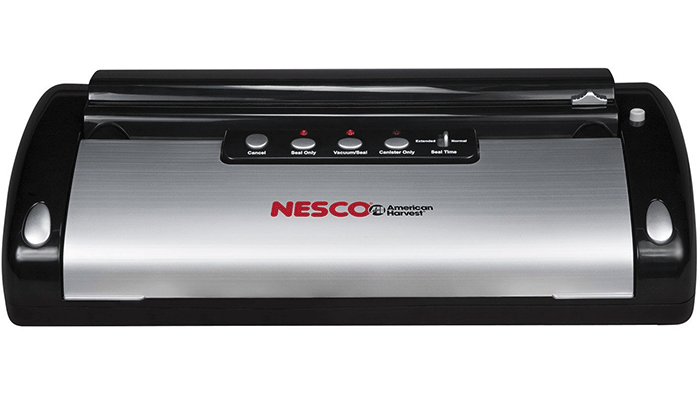 The Nesco VS-02 vacuum sealer can eliminate freezer burn and reduce food waste. It features one-touch operation and shuts off automatically. It comes with a built-in bag cutter and works especially well for moist food. This product comes with two bags, and if you’re looking for a basic vacuum food sealer, this product is worth considering. 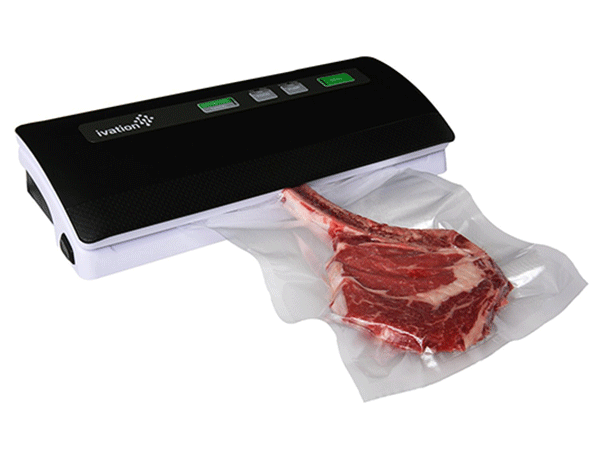 The Seal-a-Meal manual vacuum sealer requires manual operation, but it’s a very affordable product. It features a simple press-and-release system, and since it has a patented removable drip tray, it catches juices from meat and fruit. This product comes with useful indicator lights, and for easier storage, it features a compact design. Here we have the upgraded Crenova VS100 vacuum system, and it can keep food fresh for six times longer than conventional storage methods. This product uses strong vacuum pressure to remove all air from the bag, and it’s especially useful for canning jars and food storage bags. You can use this product to prolong the lifespan of snacks, nuts, fruit and meat, and it’s very easy to use. The FoodSaver V2244 is another popular model, and it comes with a total of five bags. This product features a compact size and uses manual operation. The drip tray is removable and can be washed in a standard dishwasher. This food sealer is designed to preserve delicate foods, and you don’t have to worry about it crushing the food. The accessory port is great for sealing marinates and canisters, and it can seal most foods in minutes. The top vacuum sealers can prolong the lifespan of most types of food, and they can help you save thousands of dollars on food waste. If you’re looking for an easy way to make your favorite foods last longer, then you need the best vacuum sealer.